SUNDAY NIGHT PIZZA FTW! 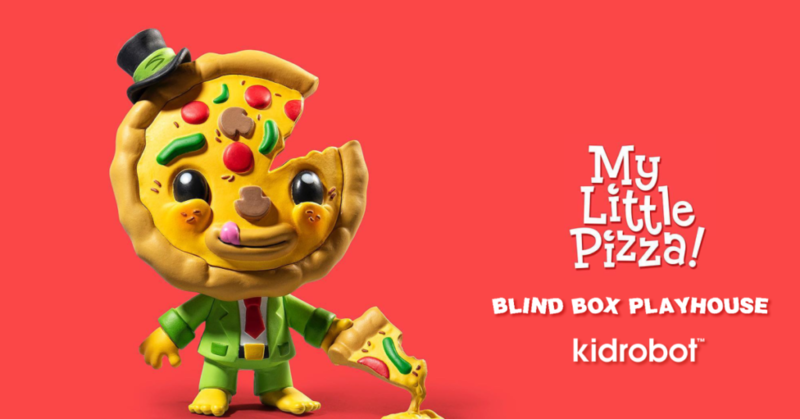 Last week our hunger got the better of us and we brought you pictures of the latest collaboration between Blind Box Playhouse x Kidrobot – Frozen My Little Pizza and it just made us even more hungry. Now this weekend we can share with you a slice of the OG colourway of My Little Pizza! Blind Box Playhouse, as an update for those at the back, are the duo of Piper & Lyla Tolleson (daughters of esteemed Designer Toy artist Scott Tolleson). Each week they put out a Youtube video giving their opinion on blind box toys. If you’ve not yet checked them out, do so HERE. My Little Pizza saw its debut this weekend at LA Comic Con on the Kidrobot booth. If you’re in attendance, go check them out on the KR booth. If you’re looking for an online release, you can expect this on 5th November! We also hear that Piper & Lyla will be in attendance at DesignerCon next month doing a signing of My Little Pizza. Stay tuned for details! So much damn talent in that Tolleson household! Blind Box Playhouse can be found also on Instagram HERE.